Margaret, Louise, and Louise’s dog Vincent head to Thunder Bay for a New Age goddess retreat. But soon the two friends have a brief falling out when Margaret is upset by the accommodations they find after they are denied their room at the Harbourview Inn. The inn has a strict no pets policy and Louise refuses to board Vincent. In addition, Margaret has no interest in the retreat, deciding instead to explore the town and its surroundings. However, when the manager of the Thunder Bay Charity Casino is found murdered in the parking lot next door to the conference, both women get caught up in the hunt for answers. The characters of Margaret and Louise were fun and the interactions between them seemed real. There were also other characters with various quirks, which enlivened the story. Small town gossip abounds so that soon everyone knows that Margaret and Louise are hunting for clues. The plot moves along well, although I have to admit I found it very unlikely that two strangers would start investigating the murder of someone they’d never met, someone who appears to have had connections with the mob. Margaret and Louise even attended his funeral which seemed strange to me. Why did they get caught up in the murder when they knew no one in the town before their arrival for the retreat? Louise does make friends easily, however, so while they didn’t know anyone at the beginning, they quickly become friends with several people and their investigation causes enough turmoil that they receive anonymous threatening letters. 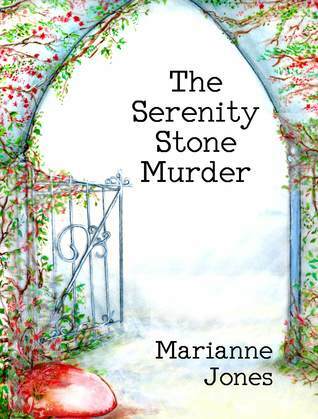 The Serenity Stone Murder is a gentle, and at times humorous cozy mystery. It is an easy and fun read and those who enjoy mysteries will certainly find Margaret and Louise to be an interesting pair of detectives.